If you were in a North Miami motorcycle accident, you should call a Miami motorcycle injury lawyer. If you live in North Miami and were injured in a motorcycle accident, you will probably need the advice and guidance of a North Miami motorcycle accident attorney. At the Wolfson Law Firm, our North Miami motorcycle accident lawyers are ready to help you and your family. We know how much a serious motorcycle can impact you and your loved ones. You will have medical bills that need to be paid. You may lose time from work. Then there is the inherent prejudice and bias against motorcycle riders that exists in our society. The North Miami motorcycle injury lawyers at the Wolfson Law Firm can answer your questions and help you get the financial recovery that you are entitled to after your North Miami motorcycle crash. If you call us at (305) 285-1115 we will meet with you and answer your questions. We can assist you in understanding what your options might be. But we can only help you if you call us so call now and let’s get started on your case. North Miami calls itself the “City of Progress”. It is located in the northeast quadrant of Miami-Dade County. It is the sixth largest city in the county. There are more than 68,000 people who call North Miami home. The zip codes for North Miami are: 33181; 33169; 33168; 33167; 33162; 33161. North Miami is also the home to Oleta River State Park which has a large concentration of Australian Pine Trees (Casuarina trees) which is an invasive species. Oleta is Florida’s largest urban state park. North Miami is home to the Biscayne Bay Campus of FIU and the North Miami Campus of Johnson & Wales. The neighborhoods of North Miami include: City Center; San Souci Estates; and Keystone Islands. 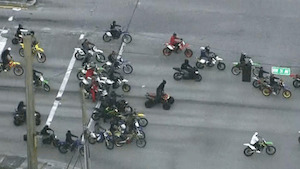 These motorcycle accidents happen all over North Miami. The main roads that bear a majority of the traffic include: I-95; Biscayne Blvd; Dixie Highway; NE 125th Street; and NW 135th Street. No matter where your motorcycle accident happens, you should consult with a Miami motorcycle accident lawyer as soon as possible. Once you call us we will schedule you for a free and confidential consultation wherever and whenever it is best for you. We encourage you to review our recent cases and qualifications. We will handle your entire case through settlement or jury verdict. If you want us to get to work on your case all you have to do is call us at (305) 285-1115. Don’t be a silent victim. Let our Miami personal injury lawyers help you get the financial compensation that you are entitled to after your North Miami motorcycle crash. Our personal injury lawyers in Miami represent people throughout South Florida including: Edgewater, Golden Glades, Sunny Isles Beach, Opa Locka, Westview, Pinewood, Biscayne Park, Aventura, Golden Beach, Midtown, Wynwood, Miami Beach, North Miami Beach and Miami Shores. Call (305) 285-1115 to speak with a North Miami Motorcycle Accident Professional Today.